I think that enough time has passed that Frozen parodies aren't as popular or as annoying as they once were. As soon as Frozen came out in 2013, suddenly everyone and their mom — or every father and their daughter — was putting their own cover of "Let It Go" or "Love Is an Open Door" on the Internet for the world to see in the hopes that it would go viral. Thankfully, the craze has died down a little bit to the point that we're getting a cover maybe once a month as opposed to a new one every day. Naturally Ellen DeGeneres took this lull in the fad in order to make her own cover and it's pretty much the only one you'll ever need. On Monday's broadcast of The Ellen Show, DeGeneres and Kristen Wiig performed a cover of "Let It Go" with one unique twist — neither of them knew the words. "Let It Go" is unquestionably the most popular song from the movie and definitely the one that gets the most covers done of it. However, be honest with yourself for a moment. Do you really know all of the words or can you just belt out the chorus and maybe the first verse? 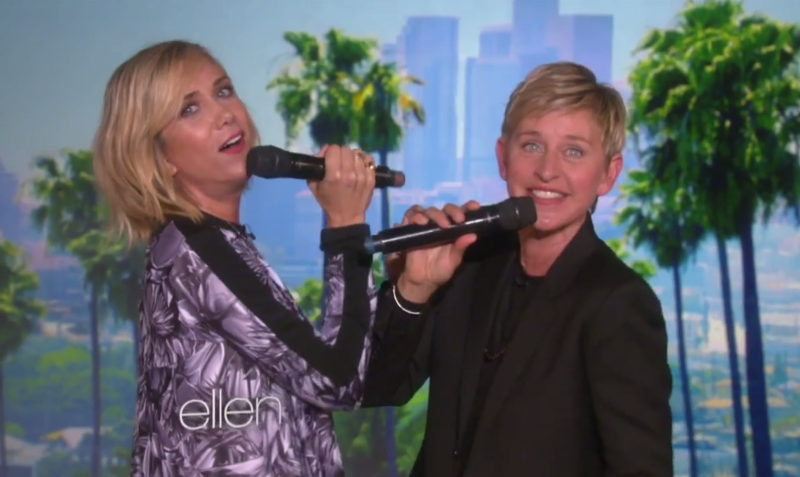 DeGeneres and Wiig both professed to be unable to do even that much, so their cover was done with the song playing in the background and the words coming up on a projector. However, just because you can read the words doesn't mean you know how they'll be sung and hilarity ensues as Wiig and DeGeneres try to stay on-beat with Elsa and fail completely. I don't know what's better, their frazzled attempts to keep up with the song when they fall behind or the way they sing in an overdramatic tone of voice that literally makes it feel like they're reading the words instead of feeling them. Either way, this is definitely one of the best Frozen parodies of all time — of all time — and everyone else can just turn off their laptop cameras and give up.